Kotetsu was enjoying his day off by going to the place he loved most, the cherry blossom forest that was located in the outskirts of the Uchiha territory. He slowly made his was across the bridge as he took in the breathtaking beauty of the trees. He really enjoyed this place, it was a place of life and death, the circle of life. The trees changed through the seasons and resembled a new beginning. Upon making his way across the bridge that connected the entrance to the forest, he came into a lovely patch of trees with a purple hue. Similar to his hair. Even though he was alone out here for now, he felt a strong bond and presence as if the Uchihas before him, came here to find peace and relaxation. After watching Kotetsu for quite a while, Ryuu really wanted to spar him. He had been watching him for about an hour now. Watching the way he moves. He seems to be very pensive, Ryuu thought. Kotetsu always seemed deep in thought. With a quickness he moves within 5 feet of Kotetsu. "Kotetsu Uchiha, I challenge you to a spar." Krysto was finally up and about. The Kaguya had been bed ridden for a few days after his last mission. He still had wrappings on his right shoulder from where the King of Beasts had injured him. He was taking a relaxing stroll around the outside of the village, as he neared a bridge he saw a robed fella walking into the forest, followed by another figure. Krysto decided to check out what was happening in there. The sudden approach of Ryuu didn't seem to phase Kotetsu, mainly because, he felt the presence of someone near and was in a tranquil state of mind. To which it was hard to have him show emotion, as in fear or being scared. At first Kotetsu didn't look in the direction of the genin, for he was busy watching the wind caress the branches and swayed the fallen petals all around. Though upon hearing Ryuu's challenge, his eyes darted towards him. They looked fierce and intimidating as no other emotion shown on his face. "I will accept," his words seemed to cut through the stillness and silence of the area. "Yet, know this. You are challenging me in a place of stature to my clan. Many Uchiha before me, came here to meditate as I do, and I will not hesitate or hold back while here." Ryuu looks into the depths of his eyes. "Hmph." is all he responded by. He slowly pulled Kuro Oni from off his back while looking at Kotetsu. He lets his left leg slide back while he keeps his eyes on Kotetsu. "I do not want you to hold back nor do i care if you hold back. I will not hold back either. You are a great ally of mine, i just want to see how strong of an ally you are." Ryuu waits on Kotetsu to make a move. Krysto follows along, he notices that it's Ryuu and Kotetsu. They are facing off in a small clearing within the beautiful forest. Knowing they both excellent sensory skills, he decides that hiding would be futile. So he walks out and stands to the side. 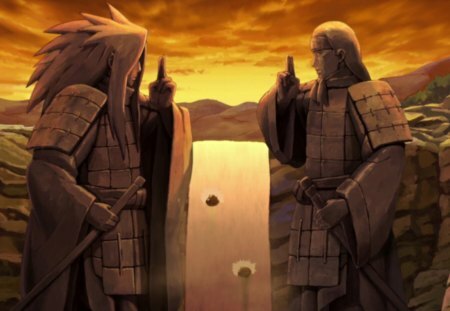 "Remember you both represent Konoha. As soon as you give the seal of confrontation, you may begin." Said the injured genin as he leaned his back against a tree, then slid down to sit. Kotetsu's eyes glared forward as he acknowledged Krysto's request. His right hand momentarily lifted from his side in order to make the seal so they could begin. Once doing so his left leg slid back and his right slightly forward. Kotetsu crouched down and distributed his weight accordingly. His left gripped the scabbard, as his right wrenched around the hilt of his wakizashi. "I will allow you to make the first move." He stated, as to urge him. Reason being, was kotetsu's stance wasn't really an offensive or defensive stance but more towards the line of counter attacking. Ryuu also gives the seal of confrontation and then reaches in his pouch with his left hand. He holds Kuro Oni in his right. He then quickly throws 3 shurikien at Kotetsu to see how he will move. By the time the crows fully dispersed, kotetsu was already behind Ryuu facing away in the same position. Then in one strong motion, he spun around, drew his blade, and slashed all at once, attempting to strike his mid-section. His scabbard, still gripped in his left hand, was ready for a follow up attack or block, depending on the genins next move. Ryuu watched as he disappeared he got into a defensive stance with Kuro Oni. He suddenly felt a slight breeze of air from behind him. As he looks out the corner of his eye he sees a shiny blade coming right towards him, he quickly puts up Kuro Oni as a block but realizes that Kotetsu's strike was strong. Ryuu holds the staff there as he uses momentum to swing the blade part of Kuro Oni up attempting to slash at Kotetsu's chest as Ryuu tries to get some blood. Kotetsu's left arm shot up, with scabbard in hand, and blocked the blade of Kuro Oni. He then spun counter clockwise and attempted to sweep the legs of Ryuu with a spinning heel kick. Even if the kick landed or not, Kotetsu jumped back out of the distance of the staff. He did so to try and make a better position for himself in this fight, since he knew the area. "Lets go" he taunted, as he held his blade wakizashi and scabbard in each hand. As if each was a weapon. Ryuu takes the hit and falls but quickly gets up and backs up a couple feet. "Hmm. Taijutsu is pretty good for an Uchiha. But its time to take you seriously. I wont hold back" He points Kuro Oni towards Kotetsu and unleashes his Byakugan. "Nor will I." His tone seemed threatening as he mimicked Ryuu's moves. Kotetsu activates his Sharingan-Tomoe2 and readies himself. His left foot slid backwards in an arc as his right slid forward and pointed towards his opponent. His body was at angle to decrease a chance of a successful hit on him as well as conceal his left hand that held the scabbard. His Iron Blood Wakizashi was firmly held in his right hand, with the tip aimed towards the inside of Ryuu's left eye. your sword should be extended a comfortable distance away from your body, and toward your opponent's throat, or perhaps his eye. This is referred to as putting him "on point". It serves as a ward against an opponent (who must, after all, get through your sword first), and can be quite intimidating, especially to an inexperienced fighter. ~hm..They've both activated their dojutsu. This is getting pretty interesting." Krysto watched on as the two genin squared off in the beautiful forest. Ryuu assumed to put Kuro Oni on his back. "Heh, finally i get to witness the sharingan." Ryuu reaches in his pocket and grabs 3 smoke bombs. He drops one where he is, another halfway between him and Kotetsu and the last one he throws towards Kotetsu's feet. "I hope your ready!" "You need not worry about me," kotetsu scoffed, as his hands tighten around his weapons. He watched as Ryuu through the bombs, and the smoke enveloped them both. Yet it seemed as if Kotetsu didn't care or mind, since he remained stationary. "Do not waste your time with such simple tactics." His voice echoed towards Ryuu, "My eyes are still able to pierce this smoke."